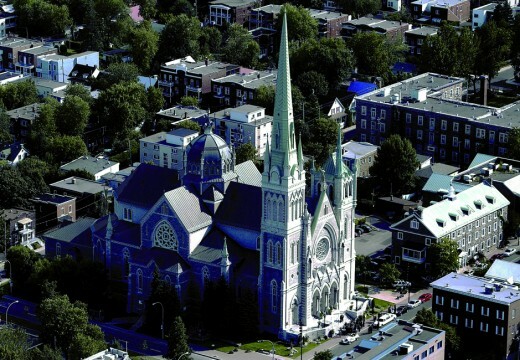 In 1887, festivities marked the inauguration of the current Saint-Antoine-de-Padoue church, which became Co-Cathedral of the Diocese of Saint-Jean-Longueuil in 1982. With its Gothic Revival architecture and Neo-Byzantine dome, the building was listed as a heritage building in 2012. It is listed as having heritage value on the Quebec government’s inventory of places of worship. Charles LeMoyne has a manor built right across from the current location of the Co-Cathedral, at what is now the intersection of rue Saint-Charles and chemin de Chambly. Construction of a castle begins at the current location of the Co-Cathedral. The first Saint-Antoine church is inaugurated near the castle. A second church is to be built on the ruins of the castle. A century later, the Co-Cathedral is recognized as a historic monument. With its imposing and grand architecture, the Co-Cathedral is 74 metres long, 41 metres wide and 81 metres high (243 feet high, 134 feet wide and 265 feet high) . It houses numerous religious art treasures, including statues, windows, organs and artifacts. Its architecture is in the Gothic Revival style, and its dome is Neo-Byzantine . Architects Maurice Perrault and Albert Mesnard intended to showcase the beautiful proportions of this church; it is they who built the high altar and imbued it with such richness. In 1930, artist Louis J. Jobin created decorative frescoes showing episodes from the life of Saint Anthony (“Saint-Antoine” in French). The Co-Cathedral’s organ was built by the internationally renowned Frères Casavant. In 1984, as witnessed by the plaque at the entryway, the Quebec minister for culture recognized the Co-Cathedral as a heritage monument. The Co-Cathedral is home to a treasure trove of religious art, including numerous impressive statues of saints, apostles and well-known religious figures. The cathedral windows depict the life of Saint Anthony, and the three-dimensional Stations of the Cross are worth a detour. Since May 1, 2004, the remains of the blessed Marie-Rose Durocher (“Mother Marie-Rose”), the founder and first mother superior of the Sisters of the Holy Names of Jesus and Mary, rest in the Marie-Rose chapel within the Co-Cathedral of Saint-Antoine-de-Padoue in Longueuil, where a rose marble tomb was placed under the altar. The Co-Cathedral’s museum is home to hundreds of religious objects, some dating back to the origins of the parish in 1697. Finally, the imposing sanctuary crypt contains the remains of Baroness Lemoyne d’Iberville, a representative of one of New France’s most illustrious families, as well as a Norman-style Calvary cross dating from the 16th century, donated by the city of Longueuil, Normandy. Daily from 8:30 a.m. to 5:15 p.m.
SUMMER SEASON (June 14 to September 3) Wednesday to Friday, 10 a.m. to noon and 1 p.m. to 4:30 p.m.; Saturday, 10 a.m. to noon and 1 p.m. to 2 p.m.; Sunday, 10 a.m. to 2 p.m.